Sometimes you get lucky in life, and everything just seems to fall into place like pieces in a jigsaw puzzle. These times are rare and you need to soak them up and wallow in them, because they’re not going to last forever. The story of my ascent of Everest last month is definitely the termination of just such a lucky streak. After trying for years to climb an 8000 metre peak and suffering numerous setbacks along the way, I suddenly have two under my belt in a matter of months, including the Big One, and it still hasn’t quite sunk in yet. The excuse for not attempting Everest was always that I wanted to climb another 8000er first so that I knew what to expect. Many times at base camp on Manaslu last autumn I listened into conversations between my two regular climbing partners Mark Dickson and Ian Cartwright with expedition leader Phil Crampton, owner of the mountaineering company Altitude Junkies, about climbing Everest this spring. 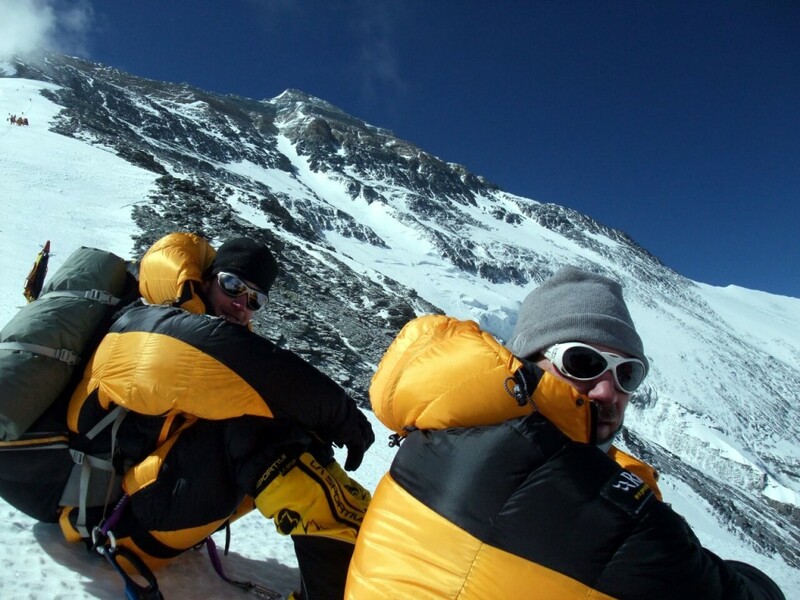 Even if I made it up Manaslu and bagged my elusive first 8000er, I knew joining them on Everest only a few months later would be out of the question. It’s expensive, and I had already quit my job to join the expedition to Manaslu. I would need to earn some more money, which meant getting a new job very quickly, and one which enabled me to bugger off again only a few months later. That sort of very short-term contract is hard to come by. The start of my lucky streak was having a suitable weather window to get up Manaslu. Then no sooner was I off the plane back in the UK than I was offered my old job back for another six month contract. “Can I do five months instead?” I asked my old boss. “Oh, alright then,” he replied. I think he thought I was joking. Everything had suddenly fallen into place. I no longer had any excuses for not attempting the Big E. Fast forward to April and my luck seemed to be continuing. I had been afflicted by an achilles tendon injury since January, which was troubling me still and had seriously limited the amount of training I was able to put in. I worried about my fitness and whether my ankle would last the expedition. Then the injury mysteriously vanished during the first few days at Base Camp, and although I may have been less fit than I was on Manaslu I seemed to be fit enough. I can only assume that ten sedentary days while we travelled by bus through Tibet and acclimatised at Base Camp were just what my ankle needed and what I had not been able to give it while I was in training. As for fitness, Phil explained this one to me: “It’s not about what you do in the three months before you arrive at Everest, but what you do in the three years before that.” I’ve certainly done my time on the big peaks in the last few years, and retained some residual mountain fitness from Manaslu. In the end my injury a few months before coming to Everest hadn’t mattered. As for acclimatisation walks and moderate exercise, something I’ve previously regarded as quite important, they’re now a thing of the past for me. If you read on you will see why. The drinking started in Nyalam, a dismal town overlooking a deep gorge just an hour up from the Nepalese border. I’ve driven through it a few times now and it always seems to hang in a damp mist. This time I had to stay there a couple of nights while we acclimatised. On 11 April this damp mist was accompanied by an inch of snow and a fug of wood smoke drifting out of every house on the main street. Ian and I found a half-decent bar up a wooden step ladder at the top end of town, and decided to take our friends there in the afternoon. 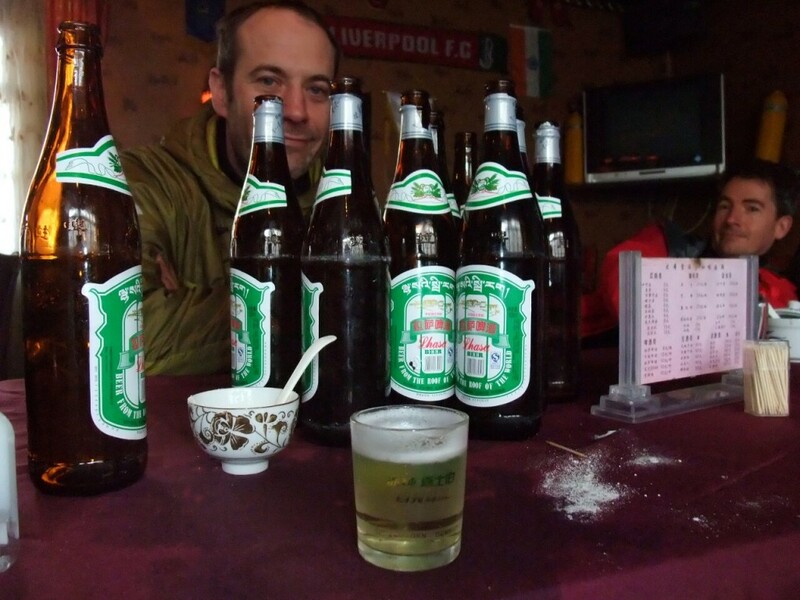 When we left there were 16 large empty bottles of Lhasa Beer sitting on the table and Phil was explaining how good it was for our acclimatisation that we’d managed to keep so well hydrated. We arrived at Everest Base Camp on 14 April and spent our first seven days there resting. 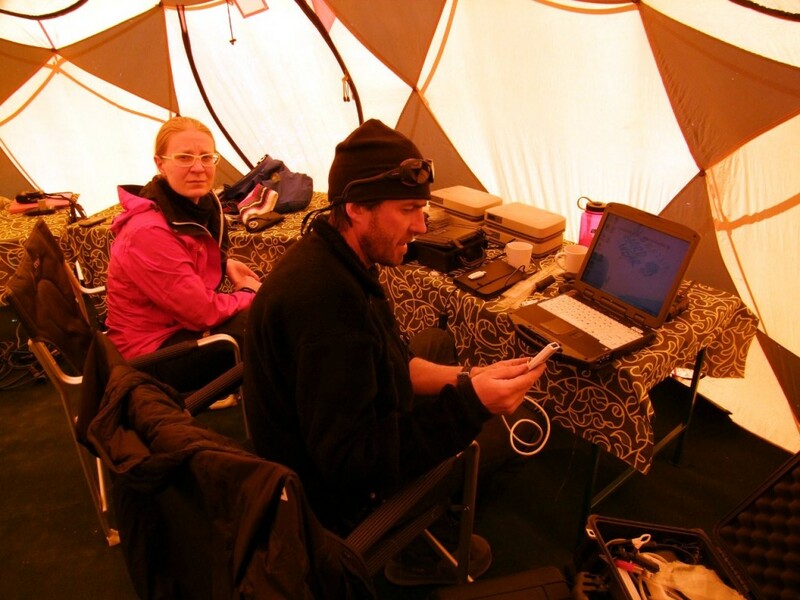 Most of our time during that period seemed to be occupied in getting our expedition communications sorted. The BGAN/Inmarsat satellite system which had been intended as our principal means of communication with the outside world, didn’t work at all unless you climbed for 20 minutes up a frozen river to a small area of hillside high above camp where there was reception. On the other hand, unusually for a base camp, there was 3G connectivity during the hours of 9 and 5, so we could post stuff to Facebook and Twitter easily with our smart phones. Blogging was more of an issue, but here our Kiwi team mate Grant ‘Axe’ Rawlinson came to the rescue. He had brought along a laptop with a China Mobile connection, which meant we could do pretty much anything with it, apart from access any website deemed to be inappropriate by the Chinese government. Most importantly his laptop became our means of accessing the daily weather reports provided by Michael Fagin of West Coast Weather in Seattle, the eventual unsung hero of the expedition. Leaving aside all the hard work put in by our Sherpas and kitchen crew throughout the expedition, Grant was otherwise the most active member of our team during those early days. He networked throughout base camp and completed an audit of all the climbers and climbing Sherpas in each team (concluding there were around 100 of each, a far cry from the 350 climbers and 400 climbing Sherpas estimated to be over on the crowded south side of the mountain). 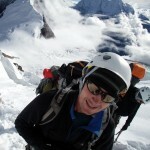 Grant was also a star blogger, regularly featuring as Alan Arnette’s Everest Blog of the Day, although he did have some stiff competition from a man called Ian on the south side, who was rumoured to be tweeting his way through the Khumbu Icefall (“Ouch, just got hit by a block of ice, ROFL LMFAO”). I was green with envy, but the magic of modern technology did have benefits for me as well. In one blog post I mentioned that I’d been unable to find the Mallory Memorial and received a response from a man in Dubai with a link to a map. I clicked on the link and found myself on Grant’s website, where there was an annotated photo of all the tents in Base Camp. I thought about sending an email enquiring of the whereabouts of the Mallory Memorial, but in the end I decided just to go over to his tent and ask him. The stand-out feature of that first week at Base Camp had to be our puja. It’s traditional for every big expedition in the Himalayas to begin with this ceremony to ask the mountain gods for safe conduct on the climb. Religious ceremonies in Tibet and Nepal are often more light-hearted than religious ceremonies in the West, but few are ever as light-hearted as ours was. After the monks have returned to their monastery the Sherpas crack open the booze, but I think they were unprepared for the acrobatic drinking games that Mark instigated. Nevertheless, Sherpas being Sherpas, they rose to the challenge and before long they were showing us Westerners how to play properly. That was until Grant drank a glass of beer while standing on his head, and that pretty much sealed the competition in favour of New Zealand. 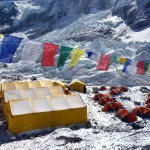 On 21 April we left Base Camp at 5160m to spend a week on our first rotation higher up the mountain. This involved spending two days ascending the East Rongbuk Glacier by the Magic Highway, a remarkable strip of medial moraine up the middle of a jagged glacier, which enables yaks to be taken all the way up to Advanced Base Camp (ABC) at 6410m. The journey involved a night at Interim Camp, affectionately known as Yakshit Camp due to its closer resemblance to a farmer’s paddock than a glacier camp. We spent three days acclimatising at ABC before tackling the North Col Wall, a steep and intricate climb through seracs and crevasses up to Camp 1 on the col between Everest and Changtse. Because of the ever-shifting ice the route through this maze changes from year to year, and I found it much steeper than when Mark, Ian and I climbed it in 2007. It was very cold and windy, and only Ian and Grant actually made it to the col, where they reported a very nasty ladder over a crevasse just before you got there. The rest of us turned back to preserve our digits and our energy. Back at Base Camp the wind continued to howl, and it was starting to get us down. I normally like to keep my fitness levels up during expedition rest days with some light walking, but the biting cold wind was preventing this. In addition to the added risk of catching a chill, the wind was also throwing up a film a silver dust into the air which was getting into our lungs and giving all of us bad coughs. Consequently the only exercise I took during the next six days at Base Camp was walking from sleeping tent to dining tent and back again. The furthest I walked from camp during that period was 20 metres downwind for a pee. To compound the damage to our fitness we were drinking alcohol copiously. One of the perks of Altitude Junkies over other expedition operators is happy hour. At 4pm every afternoon we assembled in the dining tent for red wine, cheese and Pringles. It’s all very civilised usually, but on at least three of those six days at Base Camp we ended up drinking the equivalent of a bottle of wine each. It was at this point that I revised my opinion of what constitutes good acclimatisation. Eventually we received news that the howling winds that had been hammering the mountain most of the time we’d been there were due for a break. Accordingly we made plans to start out on our second foray on 4 May. Where it had taken two exhausting six hour days to reach ABC on my first visit, this time I made it to ABC in a single relatively easy seven hour day. Yes, that’s right, after six days of sitting on my arse and boozing I was nearly twice as quick as I had been the first time. That’s the sort of acclimatisation programme I like. It was a nicer trip up the North Col Wall on 6 May as well. All of us apart from Mark and Ian, who were suffering from cold fingers and bad cough respectively, made it up to the Col this time, although I didn’t enjoy the ladder. It spanned a deep crevasse at 60 degrees, and was followed immediately by a steep gully. It briefly became known as the Ladder of Death before we discovered Everest had far harder obstacles to overcome. I tiptoed down it tentatively with a lot of help from Phil and wondered how I would ever get down it carrying my heavy pack after summiting (should we be so lucky). Everything seemed to be going smoothly for us on the north side, and all we needed now was a good summit window. By contrast we were hearing all sorts of reports of bad news on the south side. Less snow than usual meant the Lhotse Face was experiencing unseasonal rock fall. 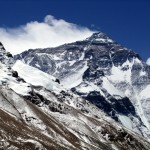 Several Sherpas had already died from various causes. 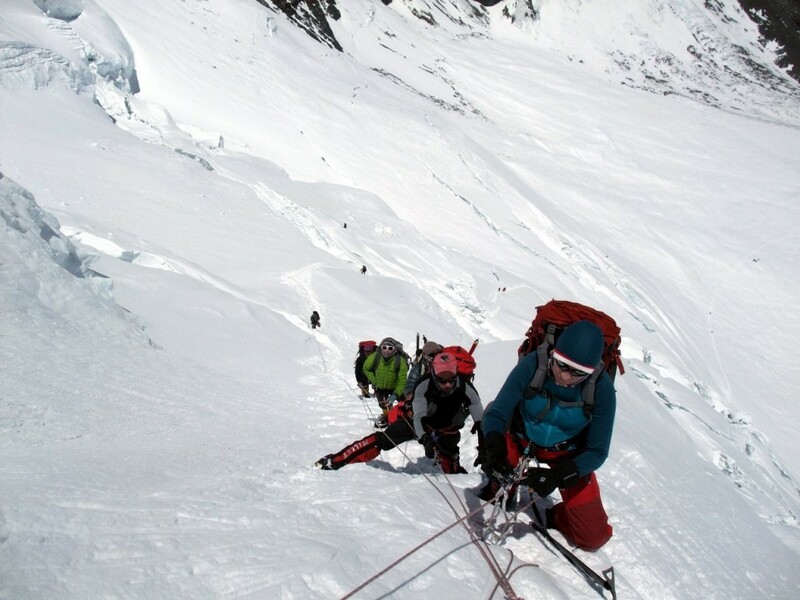 They were moving the route to a safer line but now there were doubts whether the ropes would be fixed in time for a decent summit window before the end of the season. Perhaps the biggest talking point in camp was the decision by Russell Brice and his Himex team, one of the biggest teams on the mountain, to pack up and leave while there were still several weeks of the season left. It seemed we had definitely chosen the right side of Everest to climb. 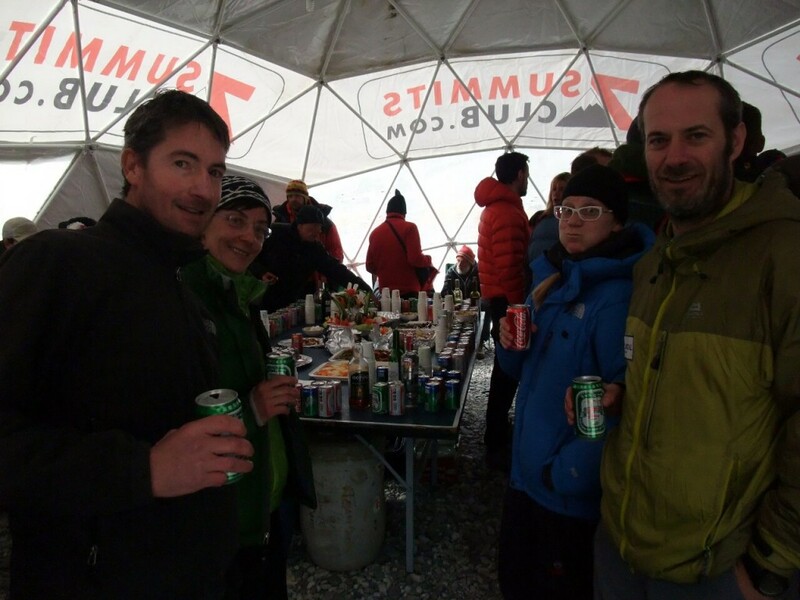 The relative quietness of the north side was emphasised on 10 May, when the Russian 7 Summits Club team held a party and very generously provided food and drink for everyone at Base Camp. Their large white dome tent nestling underneath the terminal moraine of the Rongbuk Glacier accommodated all of us with room to spare. The time for our summit push was approaching, and at last it looked as though there was going to be a drop in wind speeds on the summit ridge on 20 or 21 May. We tentatively made plans to leave for ABC on 15 May. This would enable us to spend a day or two resting there before beginning the climb proper, a five day round trip from ABC. Phil was unusually stressed on 13 May, awaiting a very important last minute weather forecast which never arrived. What was Michael Fagin doing? Then at 8pm it finally arrived by email, and we were all dragged out of our sleeping bags for an emergency meeting in the kitchen tent. High winds were returning on 20 May, but the ropes to the summit probably wouldn’t be fixed until 18 May. This left 19 May as our only possible window. I was concerned about traffic jams if everyone at Base Camp decided to go for the summit on the same day, but Margaret Watroba, who climbed Everest from the south side last year, pointed out that bad weather was a far greater danger on summit day than other climbers. The clincher was the keenness of the Sherpas. Most of them kept quiet during the meeting, despite my asking them for their thoughts. 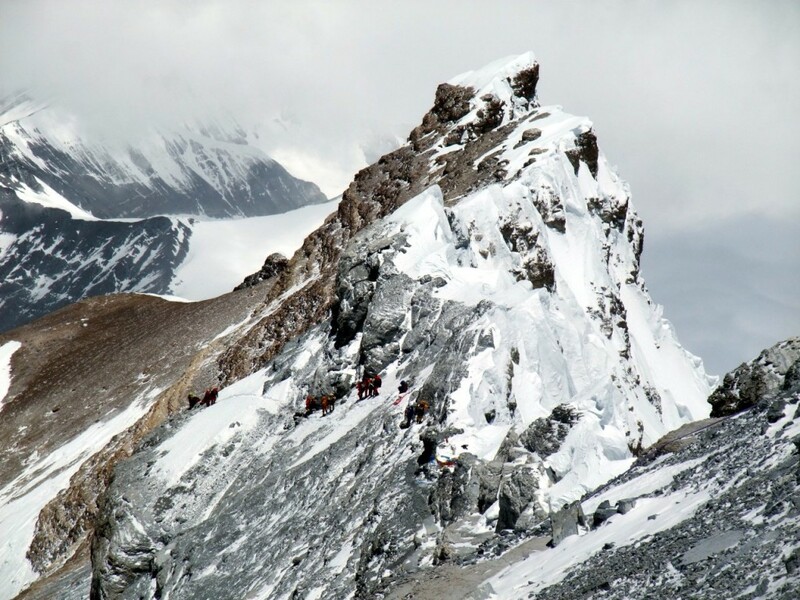 None of them wanted to influence our decision, but they had worked like Trojans getting our camps in place all the way up to Camp 3 at 8200m, and had only returned two days earlier. 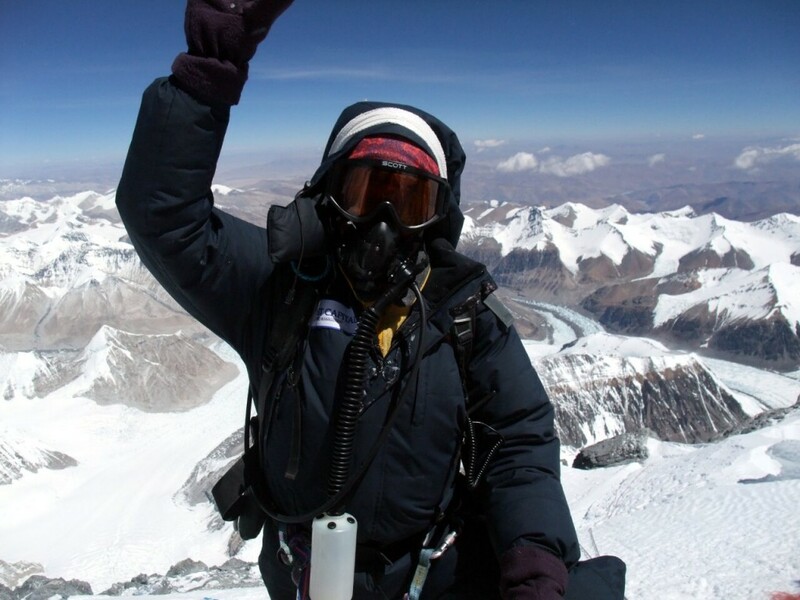 They had all climbed Everest multiple times, but only Chedar had done it from the north side before. They were all ready to do whatever it took. We unanimously agreed to aim for 19 May, meaning that unless we chose to leave the following morning, which at that time in the evening we all fancied like a turd in a swimming pool, we would have to push on through ABC without a rest day. We were all prepared to step up for this longer push. Most of us made very early starts on 15 May so that we would have longer to rest at ABC in the afternoon. I left at 6.30 and reached ABC at 1pm. Here Phil had more good news. He spoke to the rope fixers of the China Tibet Mountaineering Association (CTMA), who confirmed they would be fixing to the summit on either 17 or 18 May. Just as importantly there weren’t so many climbers up here at ABC after all. Many teams were still looking to summit on 20/21 May, and more still were holding out for another summit window on 25/26 May. It looked like traffic jams weren’t going to be a problem. It was busier than previously when we climbed up the North Col Wall on 16 May, and we were held up nearly an hour beneath the ladder, when a large team of Indian climbers were coming down just as a large group of us arrived together from below, but the sun was still in and out of cloud and we didn’t get too cold waiting. We arrived at Camp 1 on the North Col at about 4pm, where Grant and I found ourselves sharing a tent with my old friend Chongba from Manaslu, who kept us well hydrated with tea and soup. I found it difficult to force down any food, but Grant still managed to eat like a cat in a sardine factory. The following day was the most picturesque of the expedition so far, as we rose above the North Col up the North Ridge, a steep snowfield for the first 500 metres, where the snow line ends and the ridge continues up jagged rock until it joins the main summit ridge. A few metres out of Camp 1 the view opened out and we could look south across the peaks of the Khumbu in Nepal, including Pumori and Cho Oyu. Needless to say the climb was exhausting, so I didn’t appreciate the view as much as I might. The plus side was the summit ridge was right in front of us, only 1500 metres above, and the summit pyramid seemed within touching distance. If having the top of the world so close doesn’t inspire you to keep plodding nothing ever will. Halfway up the snow slope, at around 7300m, Pasang Nima (known to us as the Pocket Rocket due to his diminutive size) was waiting to help us put our oxygen apparatus on. We continued on at 2 litres a minute, and I really felt the difference initially. Camp 2 sprawls up the ridge above the snowfield, with tents ranging in altitude from 7500m to beyond 7800m. We were camping right at the top, at 7815m, and I arrived at 3pm to be greeted by Grant telling me he’d been there for two hours. Exhausted, I promptly vomited in the vestibule. Grant continued his remarkable performance throughout the evening by eating a whole dehydrated meal, while I could only manage about half a dozen mouthfuls before having to stifle another puke. The following day he shot up to Camp 3 in just two hours while I took a more leisurely (well, maybe not leisurely) four. 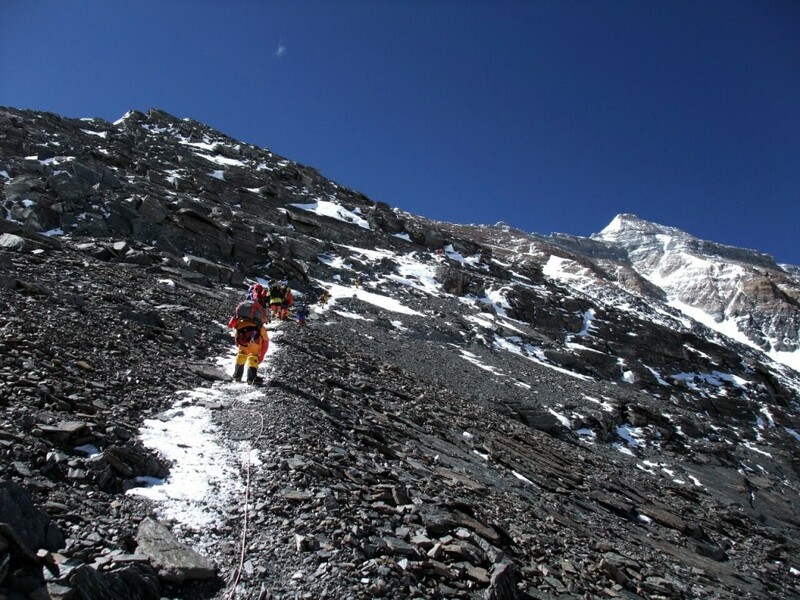 The trail from Camp 2 diverts away from the North Ridge to cross slabs beneath Everest’s Northeast (summit) Ridge. In places the trail is good, but there were also a couple of steep snowfields to climb. By the time I reached camp I found myself in a whiteout and struggling to see which of the handful of tents were ours. Fortunately I had caught up with Mark by then, who spotted Ian’s bright yellow Rab jacket through the gloom. Camp 3, the highest campsite in the world, is on sloping slabs at 8210m, a couple of hundred metres below the summit ridge. I settled in the tent between Grant and Chongba, and drank plentifully while I watched them eat again. We set out on our summit day (or night if you prefer) at 11.30pm. There were only about 60 climbers leaving for the summit that day and it turned out we were the last of them, so traffic jams were never a problem. The route from Camp 3 onto the summit ridge is mostly on good path, but there is quite a lot of scrambling too, which comes abruptly by the light of a head torch. Immediately beneath the summit ridge is a section of scrambling known as the Exit Cracks. This turned out to be so extensive that by the time I reached the top and found myself on the ridge I wondered whether I had already climbed the First Step, supposedly the first of the North Ridge’s main rock features on summit day. In fact I hadn’t and I was in for another surprise, for I had been expecting a snow plod for the most part, with a little bit of scrambling in key places. 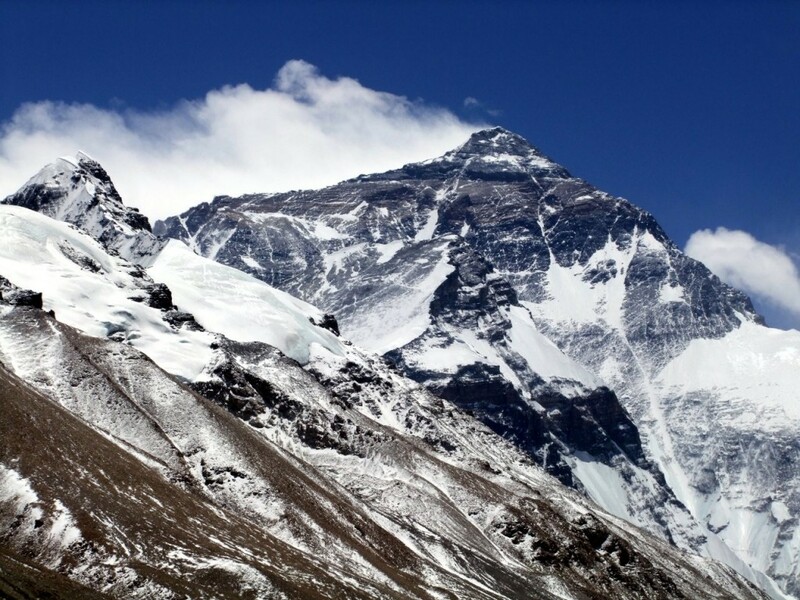 In fact there is so little snow on Everest’s North Ridge, that it’s a rock scramble for almost its entire length. I felt as though the Cuillin Ridge would have been better preparation than Manaslu. By the time I got over the First Step I knew it was the First Step because if it had been the Second Step there would have been a ladder. I wondered how the hell I was going to get down again, but that would have to wait until later. 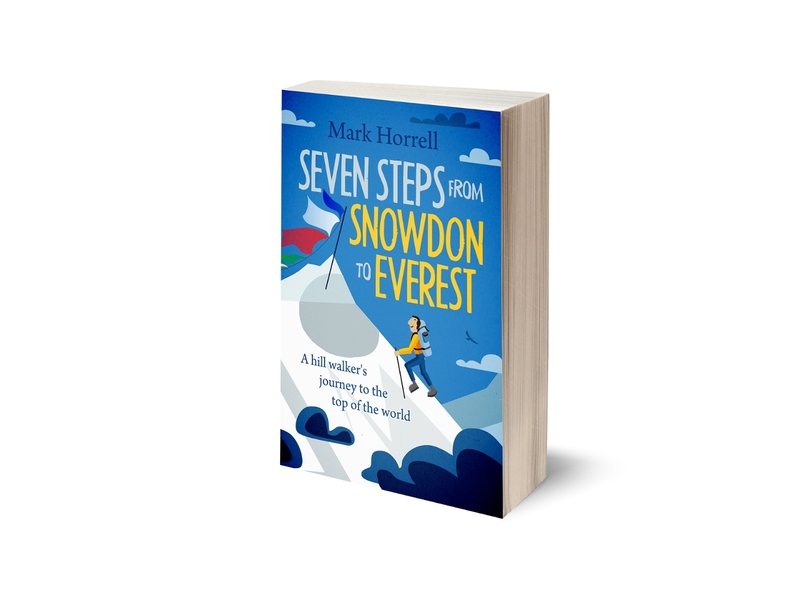 Before I got to the Second Step the sun rose up and I suddenly found myself tiptoeing across narrow ledges gently sloping down towards a 3000 metre drop all the way down Everest’s North Face. The slabs were mostly bare rock with a light dusting of snow, tricky enough in your crampons even without the three or four strands of old rope to snag them on. I passed my first dead body face up to the sky and head down towards the abyss lying just two metres below one of the slabs I sidled across. Above the Second Step the ridge broadened a little, giving some respite from the endless concentration. I was getting quite tired by then and Chongba changed my oxygen bottle for the second one in his pack. At this point the summit looked very close, providing some encouragement. The Third Step is just a short hike up the ridge, and immediately above this is the steep snowfield of the summit pyramid. In reality we still had a long way to go. My two friends Mark and Ian overtook me below the Third Step and left me far behind. At the top Chongba decided to turn my oxygen down to just one litre a minute to ensure I still had enough to get me up and back down again. A good move, but it meant I was now even more tired. I struggled up the snowfield, and had to stop several times to let past other climbers coming down from the summit. The trail angled across the snowfield, but the route above was suddenly blocked by a cliff. Fixed ropes traversed round a series of ledges staring all the way down to the Rongbuk Glacier 3000 metres below, until an easing in the cliff allowed passage up. This is the final bit of scrambling the North Ridge throws at the tired climber. Here I passed Phil, Grant, Pasang Nima, Mila and Pasang Wongchu all on the way down from the summit. I had one last snow plod over a series of ridges. Mark and Ian were resting in the lee of one of them with Ang Gelu and Kami. I congratulated them on summiting, and plodded onwards. Chongba and I reached the summit at 10am on 19 May. There was nobody else behind, but plenty of people in front of us coming up from the south side. It was slightly surreal. I wasn’t elated at all because I sensed the descent was going to be a bit of an ordeal. 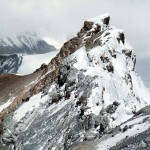 We had perfect weather all the way up – Michael Fagin had nailed his weather forecast – but here on the summit it was very windy and I sensed that the climbers on the Nepalese side must have had a more torrid time of it than we had. We stayed for about five minutes and took a few photographs before turning round again. Our descent was long but safe. I was being very careful not to put a foot or a hand wrong. My scrambling was confident until I reached the First Step, where I decided to secure myself with an abseil for the lower section. Below that I seemed to mentally run out of steam, as though I had fixed the First Step as the last big hurdle. I had a bit of a shock when I reached the Exit Cracks, but I summoned up one last mental effort and got down them safely. I finally reached Camp 3 at 5.30pm after 18 hours of climbing. Chongba had stayed with me throughout. He hadn’t tried to help me at any stage; he just waited for me to solve each problem in my own way, but he had been there, and that’s what mattered. Superstar that he is, he was exhausted as well, and we were lucky to have Grant waiting in the tent and ready to brew us up some tea. He had proved himself to be a class above the rest of us, and had got up and down in about 13 hours. By 6am the following day the wind was howling, and it was clear we’d picked the right short summit window. We hastily packed away and descended from Camp 3 as quickly as we could. When I walked into Camp 1 on the North Col four hours later the sun was shining and all of my team mates were lying there with their masks off for the first time in four days. They were all basking in the sunshine and the success. I had hardly had anything to drink in two days, and my throat was as dry as rough sand paper rubbing against a blackboard, but we were nearly there. We still had the North Col Wall to get down and the Ladder of Death, but that wasn’t so deadly after all now that we’d scrambled up the North Ridge. By 4pm I was eating chips and drinking tea in ABC, happy in the knowledge that I was up and down safely. I was exhausted and starving, and I knew my two drinking buddies Mark and Ian weren’t going to let me rest when we got back to Kathmandu, but for now I could sleep soundly. Eventually everything would start to sink in. But the achievement isn’t mine alone. I owe it all to the hard work of our incredible Sherpa team, the kitchen crew and their steady flow of chicken sizzlers, to my team mates on the mountain, Michael Fagin and his weather forecasts, the Tibetan rope fixers, and Phil the mastermind behind it all. Thanks to all you guys! You can see all photos and videos from the expedition here, and my full expedition diary The Chomolungma Diaries is available as an ebook. And if you don’t believe me that alcohol doesn’t appear to harm your summit chances, take a look at this. What a great report, I really enjoyed the read! Great read! I specially enjoyed your George Mallory piece. I’m 55, bad knee. In my next life when I do the north ridge I’ll be sure to use your acclimatization technique. Mark – it’s 4:45 pm – I’m about to go home to aclimatize, please join me in Vancouver, BC. I’m a more-is-less kinda guy. I liked the observation that doing nothing for 8-10 days helped your Achilles tendonitis to resolve. I would like to send you a sympathetic email on the Juanito Oiarzabal post.